Instead of discovering a land blanketed by dense forests, early explorers of the Pacific Northwest encountered a varied landscape of open woods, spacious meadows, and extensive prairies. Far from a pristine wilderness, much of the Northwest was actively managed and shaped by the hands of its Native American inhabitants. Their primary tool was fire. This volume offers an interdisciplinary approach to one of the most important issues concerning Native Americans and their relationship to the land. During more than 10,000 years of occupation, Native Americans in the Northwest learned the intricacies of their local environments and how to use fire to create desired effects, mostly in the quest for food. 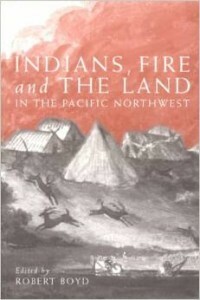 Drawing on historical journals, Native american informants, and botanical and forestry studies, the contributors to this book describe local patterns of fire use in eight ecoregions, representing all parts of the Native Northwest, from southwest Oregon to British Columbia and from Puget Sound to the Northern Rockies. Their essays provide glimpses into a unique understanding of the environment–a traditional ecological knowledge now for the most part lost. Together, these writings also offer historical perspective on the contemporary debate over “prescribed burning” on public lands.